A few weeks ago Lizz and I met with a branding agency, and during the course of our conversation they asked us about the origins of the Sequence brand and our messaging. We tried to explain to them how much we (and Dana) struggled with our narrative when we launched. Part of that struggle was something that all start-ups probably experience: it’s difficult to tell a story that hasn’t yet taken place. The other challenge though was more complicated. We weren’t entirely sure what we wanted Sequence to be. We knew what we did well, and we knew that we were working with a wide range of clients over the first 10-12 months. But after that we weren’t so sure. Would we end up focusing more on corporate events? Collaborating with non-profits? Would we develop a niche within a specific vertical or type of event? It was important for us to see how Sequence developed organically, rather than pre-labeling the company and being confined to those boundaries as we developed. The three of us couldn’t agree on much, but we were all supportive of that philosophy. Next week, amidst a stretch of five events in six days, a sixth event will fly quietly under the radar. Sequence will turn three. Hard to believe it’s only been three years, and just like with kids you can’t seem to remember what life was like before. But when I looked at the calendar a few days ago and reviewed next week’s lineup, the set of events caught my eye. A corporate conference and awards show in Philadelphia. A gala for a global brand. A 20’s-themed high-end client event for a bank. A 1,200-person stair-climbing fundraiser for a national non-profit. A 75th corporate anniversary celebration. Each of these events are interesting and exciting in their own right, but they are five projects that could not be any more different. From the objectives, to the settings, to the attendees, to the experiences themselves, they are a diverse group of events and host organizations that may share just one commonality: Sequence. What had caught my eye was a project landscape that looked almost identical to the one from three years ago. It’s possible that we simply need more time in seeing how Sequence develops and the direction we take. Maybe we’ll find that niche after all. But it’s also possible that the unchanged narrative is more than a coincidence. It could simply be the sign of a company whose original story was way more developed than we ever thought. An oldie but a goodie. 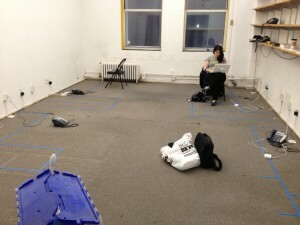 Lizz at Sequence's first office on 20 W. 20th, where we learned not to take desk space for granted.